Petty & Postlethwaite’s Shipyard. In 1815 eight plots of land bought for £155. Formerly Ashburner’s Shipyard. John Benson, Sailmaker. Workshop above Canal Offices. Fire 1856. Cattle Auction Mart now covers the area. Middle Basin provided in 1857 due to limitation created by new (railway) bridge. Railway siding on west towpath from 1870-1882 from spur off main line west of bridge. John & William White’s Shipbuilding Yard, previously occupied by Hart & Ashburner. Patent slip. Following closure of White’s Yard the area accommodated grandstands for the annual Swimming Gala. Low Furness Ironworks (James Davis’ Iron and Brass Foundry). 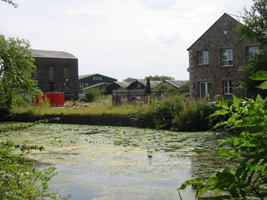 Owned by James Davis, relocated in 1850 to the canal side from Orgrave and Powka Beck. Puddling furnace producing wrought iron, never steel. A report of 1863 comments that “Two ironworks on its banks are closed”. Samuel Pollitt’s Paper Mill (formerly Furness Paper Works and Ulverston Paper Works) occupied the ironworks buildings, established c.1870, and employed 300. Railway connection.Serious fire in 1895. Armstrong Siddeley occupied buildings from 1940 to 1944 for aircraft engine servicing, and also had test-bed plant at Bardsea (now Kingfisher etc.). In 1945 premises taken over by firm of C G Wade which later became The Powder Metal Co Ltd producing metal furniture, pencil cases and naval shell casings. Relocated to Aldershot in 1955. Premises later occupied by knitting factory. Site now used by Travis Perkins, G W Waite, Acrastyle, etc. 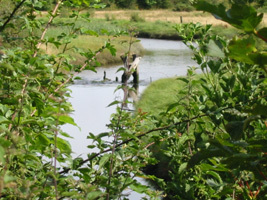 Furness Railway Bardsea Branch received Parliamentary approval in June 1876 and August 1881, opening 1882. 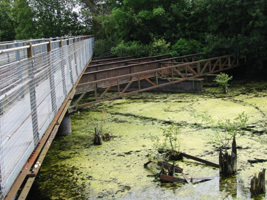 Boring for bridge foundations began February 1878. Gradwell’s tender accepted November 1878. Railway formation complete and bridge deck in situ September 1880. Hydraulically powered bridge withdrew into recess on west side of Canal, leaving navigable channel in centre. Bridge protected by wooden fenders. Work completed June 1881. Used for siding to Ironworks, September 1881. Opened for passenger traffic June 1883. Rail traffic to Glaxo ceased in 1994, track lifted in 2000. Bridge now fixed and carries Glaxo emergency water main from Newland Beck, and a public pedestrian walkway. 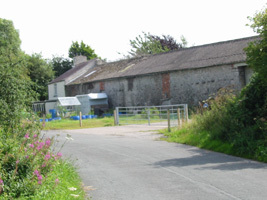 The bridge and nearby accumulator house were both granted listed building status in 2012. Galloways (of Manchester) Foundry, later the Old Bone Mill, cast components for the Leven Viaduct. North Lonsdale Iron & Steel Co.. Incorporated October 1863. Always known as the Ironworks and never produced steel. First two (of four) furnaces blown in May 1876. 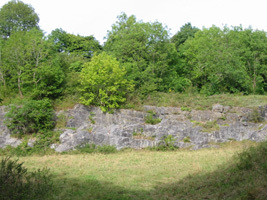 William Gradwell and James Bush bought half of the Conishead Estate including the Brickworks and opened Gasgow Quarry, contracting to supply limestone to the Ironworks. Standard gauge tramway built to link the sites. 1870-82 rail access was by spur at Six Arches along the west bank of the Canal. 1882 line from Plumpton Junction via Rolling Bridge opened. 1932 Ironworks merged with Millom & Askam Iron Works. No production at Ulverston from 1932 to 1936. One furnace in production 1937-38. Ironworks closed 1938 following accident and explosion. Refining continued at the works foundry until 1949. Ironworks site sold 1947 for building of the pharmaceutical factory of Glaxo. Slag “mossers” as wall caps on dwarf wall of Glaxo boundary. Traditional residence of the Oversands Guide. Shipbuilders Ephraim Swainson and Messrs Hart & Ashburner here in pre-Canal days. Several armed vessels built for the West Indies trade. Enclosure Award of 1812 enclosed the previously common land of Oxenholme. Carter Pool, once 50 yards wide, was narrowed and gated. 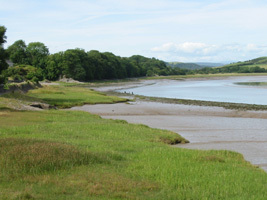 An earth embankment 8ft wide and 3ft high ran from the floodgates to Conishead Bank on the seaward side of Sand Hall (now a footpath). Saltcoats Bridge over Carter Pool built around 1870s to afford access to housing and works at Sand Hall. Maltkiln operated in Carter House Lane post 1830. The North Lonsdale ironworks built its own tidal quay by which ore was imported and pig iron dispatched. Their original Beaconsfield Pier was replaced by larger Ainslie Pier at Hammerside. Industrial developments as spin off from the Ironworks. Brickworks. Brick-making had been carried out at Sandhall since 18th century, and the merits of the local clay had been used to promote the Canal. Brick kiln on Oxenholme Common mentioned in 1760, and the road to Priory Point was called Brick Kiln Road. Priory Brickworks advertising bricks and tiles in 1856/60. Ireland’s Brick & Tile Works operated through the 19th century. In 1876 William Gradwell is listed as owning the Ulverston Brick Making Co.. Two terraces of houses were known as Brickwork Cottages. Works and quarry up for auction in 1879, purchased by Gradwell outright. Works closed c.1900. Clay dubs flooded and now angling pools. Chemical Works. Begun c.1861 as Alexander Sadler’s Tar Distillery. Sadler owned quarries in County Durham and supplied coke to the iron and steel industry, tar being a byproduct of coke ovens and required by ship-builders. In 1881 Alfred E Sadler, a “manufacturing chemist”, (?son of Alexander), was resident at Sandhall. 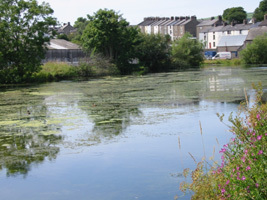 In 1886 the company also had a site on the Canal. Products included petrol, tar, pitch and napthalene. In 1904 also advertising chemical fertilisers. Workers’ housing at Sandhall called Chemical Row. Wire Works. Messrs Brand of Middlesbrough. Only had brief existence. Present in 1882, disappeared by 1919. Took malleable iron billets from the Ironworks for reheating and extrusion. Fumes vented through fine brick stack which was left as navigation aid for vessels berthing at Ainslie Pier. A station was built at Priory which was intended to serve a new housing development by William Gradwell and partners on part of the Conishead Estate. Railway construction ceased when the track reached the Priory Station. 1850 OS map shows five quarries, In 1869 Bolton speaks of two quarries – dark limestone (Wood End) and white limestone (Spring Wood and Twice-a-Day). 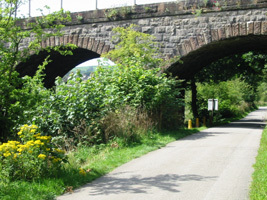 Also Ashes up-stream of viaduct – ‘bloomery’ stone used at Newland Furnace and Backbarrow. Much infilling with domestic refuse. Remains of rail sidings etc. Plumpton Junction site of former box and triangle. 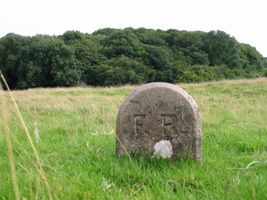 Furness Railway boundary stones. Tall home signal post. Leven Junction – Greenodd Junction spur. Iron mining remains. Haematite ore was being extracted at Plumpton as early as 1220, probably from shallow drifts, and old maps indicate the existence of old pit shafts since backfilled. From 1718 the ore deposits has been systematically exploited with ores being taken to furnaces at Backbarrow and Invergarry. Mining activity appears to have ceased by the beginning of the 19th century.